/ Modified apr 25, 2018 1:57 p.m.
Demonstrators gather to protest President Trump's decision to end the DACA program, September 2017. PHOENIX — A federal judge in Washington D.C. has given the Trump administration 90 days to explain why the Deferred Action for Childhood Arrivals program is illegal. Otherwise, it will have to start taking new applicants. If DACA is reopened to new applicants, undocumented people seeking to avoid deportation and get a work permit will have to share their personal information with the government. That means exposing themselves and possibly family members to immigration authorities. 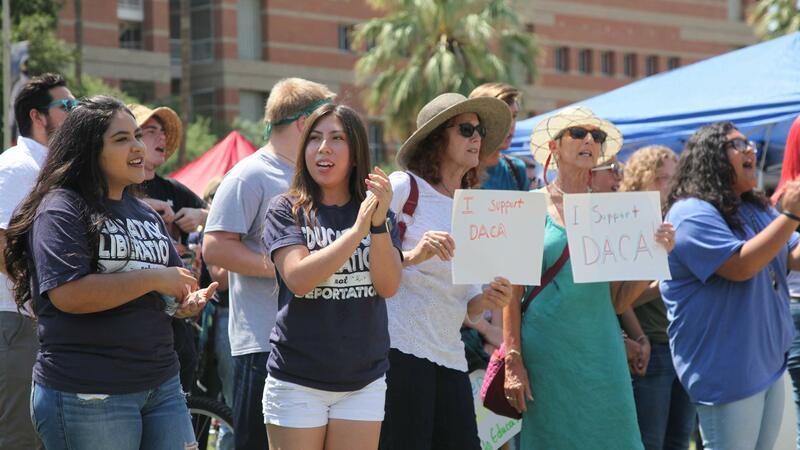 "I do believe that the risk of giving the government the information is definitely worth it, in exchange for that protection, even though it’s temporary," said Karina Ruiz, executive director of the Arizona Dream Act Coalition. "People have been calling me. ‘What is this about?’ They’re anxious to get their paperwork ready." Court orders in other cases have forced the government to keep renewing DACA permits. While the legal victories have helped, Ruiz says Congress needs to find a permanent solution.